Doubleday. Hardcover. 0385041837 Like New Condition. . Fine. Doubleday. Hardcover. 0385041837 New Condition. . New. London: Collins, 1955. First Edition of the Author’s First Book. This copy belonged to writer Hammond Innes, the great writer of post World War II sea novels and novels of adventure and mystery, with his nautical bookplate which is hand autographed by Innes and affixed to the blank middle space on the title page. Some faint foxing to outer edge, else near fine in a bright slightly used dust jacket with some dust soiling on the rear panel. Excellent association. London: Collins. Fine in Near Fine dust jacket. 1955. First Edition; First Printing. Hardcover. DJ downrated from Fine because it is price-clipped. Inscribed by Maclean on the title page. ; 8vo 8" - 9" tall; 320 pages; Signed by Author . 1981-09-12. New. Ships with Tracking Number! INTERNATIONAL WORLDWIDE Shipping available. Buy with confidence, excellent customer service! Collins, London., 1955. First edition. Octavo. 320 pages. Endpaper map and diagram of the ship. The author's first book, a novel of Second World War naval action.Head and tail of spine slightly bumped. Very good indeed in near-fine, slightly nicked dustwrapper with the faint trace of a small label on rear panel. Doubleday, 1960-06-01. Hardcover. Very Good. No dust jacket, very minor shelf wear, otherwise excellent condition. Fontana. Used - Good. Ships from the UK. Former Library book. Shows some signs of wear, and may have some markings on the inside. 100% Money Back Guarantee. Your purchase also supports literacy charities. London: Collins, 1955. [Nautical thriller] FIRST EDITION. Author's first book. Octavo (21 x 15cm), pp.320. Publisher's red cloth with gilt titles to spine, illustrated map endpapers, pictorial dust-wrapper by John Rose. Contents clean, mixed paper stock shows minor differences in colour, edges a little dusty, small chip to cloth at top of spine. Jacket mildly edgeworn and a touch darkened to spine, price-clipped. A near fine copy. 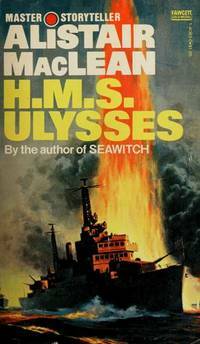 The story of men who rose to heroism, and then to something greater, 'HMS Ulysses' takes its place alongside 'The Caine Mutiny' and 'The Cruel Sea' as one of the classic novels of the navy at war. It is the compelling story of Convoy FR77 to Murmansk - a voyage that pushes men to the limits of human endurance, crippled by enemy attack and the bitter cold of the Arctic. London: Collins, 1955. 1st Edition. Soft cover. London: Collins, 1955. 1st Edition. Soft cover. First Edition of Alistair MacLean's first book, a classic World War 11 sea thriller. Advance Proof Copy. Very good or better in the publisher's gray stiff card wrappers showing some overall use. Paper label to the front cover printed black. 8vo. 320 pp. Fontana Books. Used - Good. Ships from the UK. Former Library book. Shows some signs of wear, and may have some markings on the inside. 100% Money Back Guarantee. Your purchase also supports literacy charities. 2011-04-05. New. Ships with Tracking Number! INTERNATIONAL WORLDWIDE Shipping available. Buy with confidence, excellent customer service! 1955. London, Collins, 1955. 8vo., original cloth with dust wrapper. A very good copy. First edition of the author's first book. Collins, 1955. A first edition, first printing published by Collins in 1955. A near fine book without inscriptions in a very good clipped wrapper with a closed tear to the head of the spine and front panel. Edges a little rubbed. 2006-08-08. Good. Ships with Tracking Number! INTERNATIONAL WORLDWIDE Shipping available. May not contain Access Codes or Supplements. May be ex-library. Shipping & Handling by region. Buy with confidence, excellent customer service! 1983-02-12. Good. Ships with Tracking Number! INTERNATIONAL WORLDWIDE Shipping available. May not contain Access Codes or Supplements. May be ex-library. Shipping & Handling by region. Buy with confidence, excellent customer service! 1981-09-12. Good. Ships with Tracking Number! INTERNATIONAL WORLDWIDE Shipping available. May not contain Access Codes or Supplements. May be ex-library. Shipping & Handling by region. Buy with confidence, excellent customer service! New York: Doubleday, 1956 First Printing. VGood+/VGood+. Publishers Review Slip laid in. Book shows minor bumping along bottom edge. Jacket shows edge wear with light chipping at spine ends and corners. Not remainder marked.. First Edition. Hard Cover. Very Good +/Very Good +. New York, U.S.A.: Doubleday & Co. Hardcover. A letter from Twentieth Century Fox, Hollywood, to Mr Robert Bolt asking him to write the screenplay for the film is included. . Very Good. 1956. 1st American Edition. Garden City: Doubleday & Company, Inc., 1956. Hardcover. F/VG. 1st edition, 1st printing. Author's first book. Price clipped jacket has chipping at spine and flap fold ends and rubbing on folds and rear panel. We offer a LIFETIME GUARANTEE. See KHBOOKS for details. Fontana Books. Used - Good. Good condition. Slightly dampstained. Amereon Ltd, 2004-06-15. Hardcover. Used:Good. Amereon Ltd, 2004-06-15. Hardcover. Good. Collins, 1955. First edition. Hardcover. Good in fair dust jacket. Price clipped. 320 p. Book Condition: Good. Dust Jacket Condition: Fair. First Edition. 320 pages. Dust jacket has edge wear and tearing along edge and spine. Previous owner's name written on dust jacket front, and 1st end page. Pages have foxing and are tanned. Previous owner has stuck a newspaper book review from 1955 on inside cover but can be removed. Quantity Available: 1. Pictures of this item not already displayed here available upon request. Inventory No: 0000236. .
Fawcett. MASS MARKET PAPERBACK. 0449140830 New Condition. . New. Sterling. PAPERBACK. 1402790341 New Condition. . New. Fawcett. MASS MARKET PAPERBACK. 0449129292 New Condition. . New. 2011-04-05. Good. Ships with Tracking Number! INTERNATIONAL WORLDWIDE Shipping available. May not contain Access Codes or Supplements. May be ex-library. Shipping & Handling by region. Buy with confidence, excellent customer service! Collins. Very Good+ in Good+ dust jacket. 1955. First British Edition; Fourth Printing. Hardcover. Lter printing of teh First UK Edition. in red cloth boards. Dust wrapper is heavily torn, but 90% or better compelte, and protected in an acid free mylar cover. Both book and jacket show modest edge and corner wear. .
London: Collins. VG: in very good condition with rubbed and chipped dust jacket. Cover marked. Tape repairs to jacket interior. 1955. First Edition. Red hardback cloth cover. 210mm x 150mm (8" x 6"). 320pp. .
London: Collins. Very Good+ in Very Good dust jacket. 1955. First Edition; First Printing. Hardcover. 8vo; 320 pages; Price clipped dust jacket with minor rubbing and edgewear. .
Collins 1955 (1st UK). First Edition. . A wonderful example of the first edition, first impression. Wrapper is price-clipped and has a small tear to top of spine otherwise Fine in a Nr. Fine d/w. Garden City: Doubleday. 1956. First American Edition. Name and date on front endpaper otherwise very good in dust jacket with wear at base of spine and nicks at corners. .
Doubleday & Company, Inc., Garden City, NY, 1956. Octavo, hardcover, VG in lightly edgeworn, good, green pictorial dj. 316pp; Naval adventure fiction. Author's first book. first American edition Endpapers show diagrammatic drawing of H.M.S. Ulysses. showing 68 points on ship.. Very Good/Good. Ba72: Fawcett Gold Medal. Very Good. 1955. Paperback. Spine is straight, binding is tight, one page has a crease otherwise clean and unmarked. Book shows mild shelf wear with light creasing. .
Fawcett. MASS MARKET PAPERBACK. 0449140830 Like New Condition. . Fine. Fawcett. MASS MARKET PAPERBACK. 0449129292 Like New Condition. . Fine. Sterling. PAPERBACK. 1402790341 Like New Condition. . Fine. London: Collins, 1955. Book. Good for old Age. Hardcover. First Edition. Book Size. the story of a ship in time of war. All of our books are in the shop, and are 'real' books. We try to post the same day as the order. Descriptions are conservative. Postage rates may be lower than ABE estimate, please use Ask Bookseller a Question to confirm availability and postage cost, use [Ask Bookseller a Question] option below to confirm availability and get accurate postage quote for this item (the amount quoted is for an 'average' hard-cover book of up to 1kg in weight). St James's Place, London: Collins, 1955. First Edition. Hardcover. Very Good/Very Good. 8vo - over 7¾" - 9¾" tall. John Rose. 1955 First Edition. Size 8vo, 8" x 5", 320 pages. Red hard cover with gilt titles to the spine. With endpaper maps at front and diagram at rear. In unclipped pictorial dust jacket designed by John Rose. Dust Jacket Condition: Very Good. Back cover slightly spotted, corners and head and tail of spine slightly chipped, not price clipped, price 12s. 6d. net. Book Condition Very Good, gilt on spine slightly dulled, a few spots to page edges, a few faint spots to prelims and ends, owner's stamp on front endpaper map, small WH Smith label to lower edge of rear pastedown, else contents clean, pages clean. The author`s first novel, an outstanding document on the war at sea, His service in the Royal Navy gave him the background for this book, although he acknowledges help from his brother, who was a sea captain in the Merchant Navy. Alistair MacLean of course, went on to write many more novels of thrilling adventure. THE COMPANION BOOK CLUB. Used - Good. Ships from the UK. Former Library book. Shows some signs of wear, and may have some markings on the inside. 100% Money Back Guarantee. Your purchase also supports literacy charities. Fawcett Gold Medal. Near Fine. HarperCollins Publishers Ltd, 01/07/1969. Hardcover. Collectible - Acceptable. No inscriptions, pages good, although slightly yellowed. No dust jacket, hardback cover slightly scuffed on edges. First Published 1955.